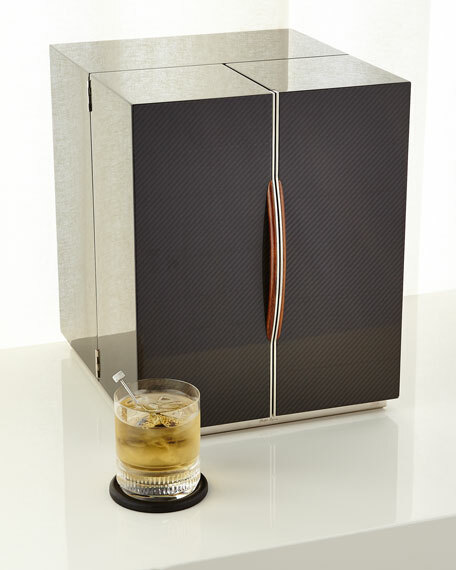 Inspired by Mr. Lauren's collection of rare Bugattis, this mixologist box combines a carbon-fiber front with a burl wood and leather interior for the ultimate cocktail-making kit with a RL twist. 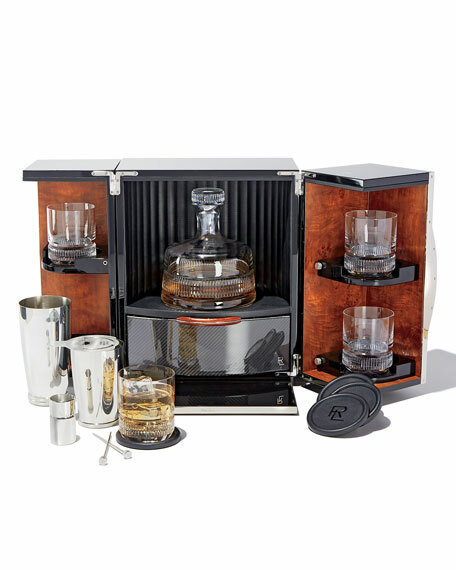 Automotive-inspired details define the barware and accessories housed inside, from the hand-cut grooves on the mouth-blown crystal glasses to the leather coasters' "RL" stitchinga nod to vintage car logotypes. Set includes a decanter, four double-old-fashioned glasses, four cocktail picks, four coasters, a shaker, a strainer, and a jigger. Box: carbon fiber, leather, burl wood, lacquer, wood composite and brass. 24% lead crystal decanter and glasses. Cocktail picks, shaker, strainer, jigger: pewter-plated brass. 13.3"L x 12.3"D x 15"T.
"The Chocolate Swatches" Signature Chocolate Collection. 2.25"Sq. x 10.5"T. Includes: Dark Raspberry, S'mores, Toffee Crunch, Hazelnut, Dark Espresso, Almond, Caramel, and Milk. Made in the USA of imported materials. Allergen Information: Contains dairy, almonds, and hazelnuts. Chocolate covered pretzel box collection. Flavors include: milk chocolate mini buttons, milk chocolate crispy wafer, white chocolate cookies and cream, and dark chocolate sea salt. 7.8"Sq. x 2.2T. Imported. Allergen Information: Contains dairy. An NM favorite chosen by the editors of ELLE DECOR . Box made of Limoges porcelain. Accented with 24-kt. gold. An NM favorite chosen by the editors of ELLE DECOR . Box made of Limoges porcelain. Accented with 24-kt. gold. 6.5"W x 4.5"D x 1.5"T. Comes with two decks of playing cards. Made in Portugal. Handcrafted butter dish. Hand-glazed heavy-gauge steel underbody. Hand-painted Courtly Check® decoration. Faux-cinnabar and brass-accented knob. Hand wash. 9"L x 4"D x 5"T. Imported.